I've tried some searching, but haven't directly found the answers to what I am trying to do. 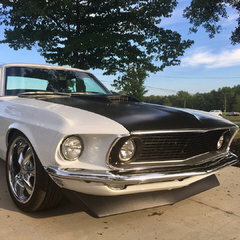 I am short on classic mustang experts where I live. I do have similar problems on my 1969 and my 1964.5, but I believe they have different problems/needs. My goal is to have a comfortable driving experience that doesn't break the budget. Except for maybe new shocks, the rear suspension will not change. Right now both are "squirrelly" on the highway, feel EVERY crack in the road, and feel like something is about to fall off when there is something larger than a crack. I know I need to look into the steering part of this by making sure that its packed with grease with the possibility that it/they might need to be replaced. The 1969 has a rebuilt front suspension with the same shocks (Monroe) with 18 inch wheels with disc brakes. I believe the 18 wheels (previous owner put them on) are a part of the problem in its current setup. So should I get new shocks? Which brands are best for daily driver? Should I install a negative camber wedge kit? https://www.npdlink.com/store/catalog/Suspension_Tuning-367-1.html Should I also install a bump steering kit as well? https://www.cjponyparts.com/baer-bumpsteer-kit-1967-1969/p/BSK2/ What else would you recommend? (we are already at 55 + 355 + 190 = 600.00 in parts) The 1964.5 (I know I'm technically in the wrong forum, but I believe the problem/solutions can apply) I have not spent my full attention on yet. It has the "Granada swap" disc brakes and 15 inch wheels. I am not sure of the condition of the suspension parts. Should I just do the "Shelby drop" since it has 15 inch wheels? Purchase correct geometry spindles? http://www.discbrakeswap.com/Mustang Disc Brake Conversion Kits Parts SWAP.2.html and replace any worn out components What else would you recommend? Guys, I'm about to lose it! I got an entire suspension setup (just for street driving/daily driver) from global west which came with Double Adjustable Viking shocks and now my car is SO bouncy! I hate driving my car now! It looks so great and rides so terrible. I've tried so many different settings and none seem to be close to a normal ride. Right now I'm at 1C 4R and that's about the closest I've been, but I'm still boy confused so much on a road that seems pretty flat. I have 18" torque thrust 2's with meaty low pro Nittos. I got All Global West uca and lca, sway bar, frame rails, Shelby drop, Monte Carlo, Viking DA coilovers in front, reverse eye leafs w DA Vikings in rear....borgeson ps if moreinfo is needed I'm glad to give it! Just PLEASE SOMEONE HELP!!! Hey guys, I want better handling in my car. I want it to handle like a newer car (some say you can't do it, others say you can get it better than a newer car). I started out with 5k in mind, but I just got a quote from TCP for $10,500. Now that's a complete suspension (Rack, Upper and lower, coilover, strut rods, antiroll, pumps, hoses etc for front, Subframe Connectors and G-bar coilover setup with antiroll in the rear). I definitely want the internals of my car to be brand new since I'm slowly transforming this car into a daily driver for decades to come. I'm just double checking my work to make sure this is the route I should go or are there components I should switch out from TCP to another brand? Also, I would love to have a lower cost, but I've heard that Unisteer is a cheap rack from a few different shops. I've also heard cons about Flaming River. Who has switched to a Rack? How do you feel about it? As of now I have a pretty stock car with a fairly new manual steering box, Willwood disks all around, 18" wheels and it's fun to drive. I'm just getting sick of manual and I'd like it to handle better around corners and be easier to drive. Holiday Deals from Total Control Products! Well, here we are the day before Thanksgiving. Some of us are stuck at work, some are traveling, and others are already out in the garage being thankful for the horsepower that has been given them. We will be closed tomorrow and Mike will be the only guy answering the phone Friday (7-3) and Saturday (8-1). That's Pacific time, of course. You can also stop in for will calls. However, that's not the only way you can save. We are not going to limit our sales to just one day, or just one weekend. All of the special pricing and discount codes are live NOW on our website. They're good through December 31st. You can use them ordering online or over the phone. CLICK HERE To View Sales and Discount Codes on Suspension and Chassis Components from Total Control Products! Hello all, I'm glad I found this forum. I'm hoping someone can give me some advice here. I have a 69 coupe that I started restoring 8years ago. Then the kids started coming, and the car restoration stopped. I got it back on the road last year, but I really don't like putting my kids in it the way it likes to drift all over the road. Unfortunately, I really don't have any real money to put into it these days. But I found a guy selling an entire Mustang II front end. I know the are kits that you can buy for the car, but will it work just using the actual front end from the 2? Thanks in advance for any help. I've got my engine parts on order to get the motor running. Next project is suspension and steering upgrades/replacement. 1. I'm want to replace it all with stock style suspension with upgrades like adjustable strut rods and roller spring perches. I also want to do the UCA drop and install an export brace. 2. For the steering I have stock power steering with new valve, power ram and rebuilt pump from Chocko and and want to do new tie rod ends and roller idler arm. I've been looking at ORP, Daze and Street or Track. It gets a little confusing because ordering kits from one site or another include different parts. Also, I don't readily see things like the sway bar bushings or rubber bump stops. Should I just replace the sway bar? Does anyone have a good list of the parts I need to check off on this job? This is the first time doing this for me and I'd hate to get sidelined half-way through a weekend of work because of something that I forgot to order. When I get to this it should be the last thing before I can drive my car again. Hey guys! I am new to this forum and have a question about some parts on a 73 Ranchero GT working on my 69 Mach which I'm building into a driver Boss 429 tribute. I just bought the Ranchero for the 429 4V and the auto trans but I'm wondering if I can use anything else from it? PS setup, PB parts, AC system, pedals, steering column, etc? My car is a rolling shell of all new metal so anything I can use from this Ranchero is a big help to me. The Ranchero is a complete running and driving car that is just rotting and the interior is shot. Being a 73 its not worth saving but the engine and trans can be built and are worth something to me! :laugh: Thanks in advance for any input guys! Brad..